The extra heat and increased traffic on the road during the summer can really take a toll on your vehicle’s oil. These extra factors during the summer can make your engine oil lose its effectiveness faster than normal. 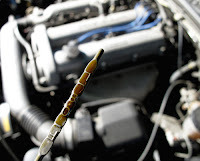 Here’s a cool trick to visually test your oil to see if it still has more miles left in the tank or if it is need of a change. First, make sure your vehicle has been parked for several hours and that the engine is cool. Next, pop your hood and pull the oil dipstick out. Then dab some of the oil from the dipstick and onto your index finger or thumb. Rub the oil between your index finger and thumb and make note of how it feels. If the oil feels dirty/gritty and the oil has a dark color, then it is probably time for an oil change. If the oil is smoother and is not as gritty, then you are still good to go. After you are finished testing, make sure to thoroughly wash off the oil from your fingers. As you are testing, don’t forget to check your oil level, make sure it is full and ready for driving action. If your oil fails this test, then bring your vehicle over to your nearest Jiffy Lube of Indiana for a quick Jiffy Lube Signature Service Oil Change. No appointment and no worry, just pull on up and one of our certified technicians will take quality care of your vehicle.